Evidence based on early climates and on current global warming requires revision of the mostly-linear IPCC climate change trajectories proposed for the 21st to 23rd centuries (Figure 3). The polar ice sheets, acting as thermostats of the climate, are melting at an accelerated rate. 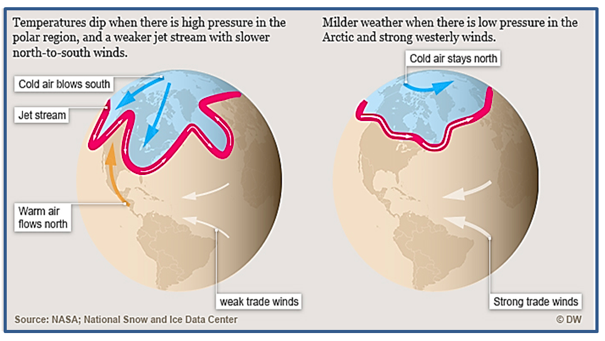 Polar temperatures have been rising at twice the rate of lower latitude zones, weakening the jet stream and the Arctic boundary, which are becoming increasingly undulated (Figure 4). This allows cold air masses to breach the boundary as they move southward, as happened recently in North America and Europe, while warm air masses migrate northward. As the large ice sheets are melting large pools of cold ice melt water are forming in the North Atlantic Ocean south and east of Greenland (Rahmstorf et al. 2015) (See this). The AMOC (Atlantic Meridional Ocean Circulation) is slowing down and the probability of future transient freeze event/s (stadials) lasting few decades or longer (Hansen et al. 2016) is increasing. The juxtaposition of polar-derived freezing fronts and tropics-derived warm air masses leads to a rise in extreme weather events (Figure 1). Figure 1. Tipping points in the Earth system (Lenton et al., 2008) (see this) Creative Commons BY-ND 3.0 DE license. More than 30 years since Professor James Hansen, then NASA’s chief climate scientist, presented a stern warning to the US Senate regarding the existential risk posed by global warming (see this), the consequences of the ignorance, criminal denial and pro-carbon ideology by vested interests and their accomplices among the political classes and in the media, are upon us, as the climate system is shifting into a dangerous uncharted territory. 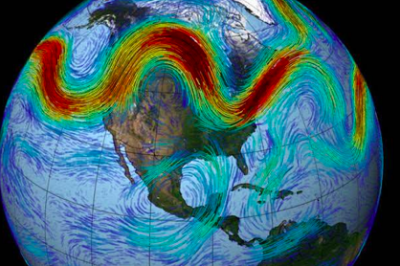 While the Earth as a whole continues to heat, transient temperature polarities between warming land masses and Arctic-derived cold air masses lead to extreme weather events (see this). Arctic air temperatures for 2014-2018 have exceeded all previous records since 1900. According to NOAA, Arctic warming has led to a loss of 95 percent of its oldest sea ice over the past three decades. Reports of the International Panel of Climate Change (IPCC), based on thousands of peer reviewed science papers and reports, offer a confident documentation of past and present processes in the atmosphere. On the other hand when it comes to estimates of future ice melt and sea level rise rates, the IPCC models are subject to a number of uncertainties. This includes the difficulty in quantifying amplifying feedbacks from land and water, ice melt rates, linear versus irregular temperature trajectories, sea level rise rates, methane release rates, the role of fires and the observed onset of transient freeze events. Figure 2. 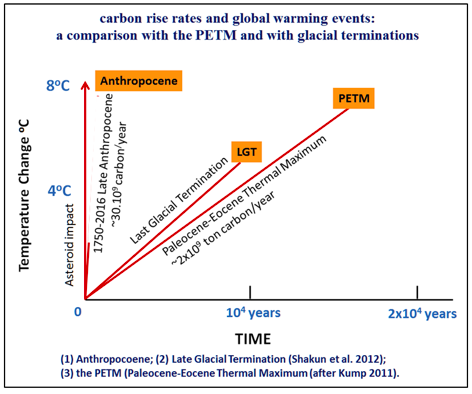 Atmospheric carbon rise rates and global warming events: a comparison between current global warming, the Paleocene-Eocene Thermal Event (PETM) and the last Glacial Termination. Linear to curved temperature trends portrayed by the IPCC to the year 2300 are rare in the paleo-climate record, where abrupt warming and cooling are common during both glacial and interglacial periods. At +4 degrees Celsius above pre-industrial temperature, projected by the IPCC for the end of the 21st century, life on Earth could be depleted to levels such as existed in the wake of previous mass extinctions of species (see this). There would be no smooth transition toward +4 degrees Celsius but irregular heating including a series of extreme weather events and transient temperature reversals induced by the flow of cold ice melt water from the melting glacial sheetsinto the oceans. Hansen et al. (2016) (see this) used paleoclimate data and modern observations to estimate the effects of ice melt water from Greenland and Antarctica, with cold low-density meltwater capping warmer subsurface ocean water. Ice mass loss would raise sea level by several and later tens of meters in an exponential rather than a linear response. Sharp drops in temperature, reflecting freeze events in the Atlantic Ocean and the sub-Antarctic Ocean and their surrounds, would reach -2oC for several decades (Figure 3). These projections differ markedly from IPCC models which portray long term ice melting values raising sea levels to less than 1.0 meters by the end of the 21st century (see this), an estimate difficult to reconcile with satellite gravity-based mass loss estimates by Rignot et al. (2011) (see this) and others. 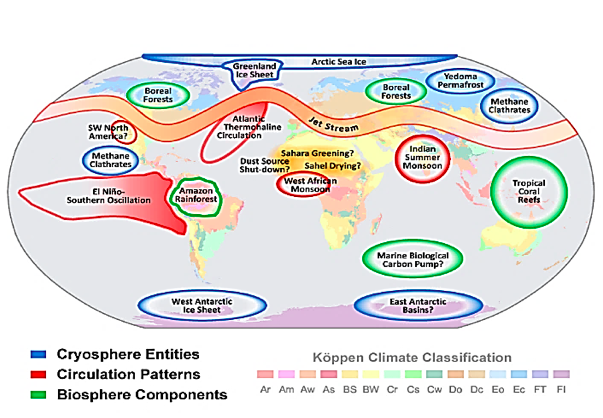 With the breach of the Arctic boundary (Figure 4) the world’s climate is moving into uncharted territory, with significant implications for the planning of future adaptation efforts, including preparations for sea level rise and for deep freeze events in parts of Western Europe and eastern North America. As the Earth warms the increase in temperature contrasts across the globe, and thereby an increase in storminess and extreme weather events, as occur at present, need to be considered when planning adaptation measures. These would include preparation of coastal defenses from sea level rise and construction of channels and pipelines from flooded regions to drought-stricken zones. In Australia this should include construction of water pipelines and channels from the flooded north to the Murray-Darling basin. Since many in authority do not accept, or only pay lip service to, climate science, it is a good question whether governments would be investing in adaptation measures in time. In particular no plans appear at hand for draw-down of CO2– the one measure which could potentially arrest global warming. In this regard the reluctance to date to undertake meaningful mitigation measures does not bode well. The powers to be are now presiding over the greatest calamity that has ever befell on humanity and on much of nature.